Picking in the top six for the fourth time in five years, general manager Mike Maccagnan needs to crush it on April 25 because it probably will be his last time in this position if he doesn’t. If the New York Jets are in the same spot next year, there’s a good chance somebody else will be doing the picking. So, yes, he needs to make a franchise-altering move, and the best way to do that is to get out of there. The best-case scenario for the Jets, sitting at No. 3 overall, is to trade down a few spots and recoup the draft capital they used last year in their blind trade-up for a quarterback, which turned out to be Sam Darnold. That cost them three second-round picks, well worth the price if Darnold builds on his late-season ascent. If Maccagnan can execute a reverse of his St. Patrick’s Day 2018 blockbuster, it would give the talent-needy Jets a real chance to improve the roster for new coach Adam Gase. To pull if off, they could use a big assist from Jon Gruden. The Oakland Raiders, who own the fourth pick, can do the Jets a solid by expressing interest (real or fake) in a quarterback. 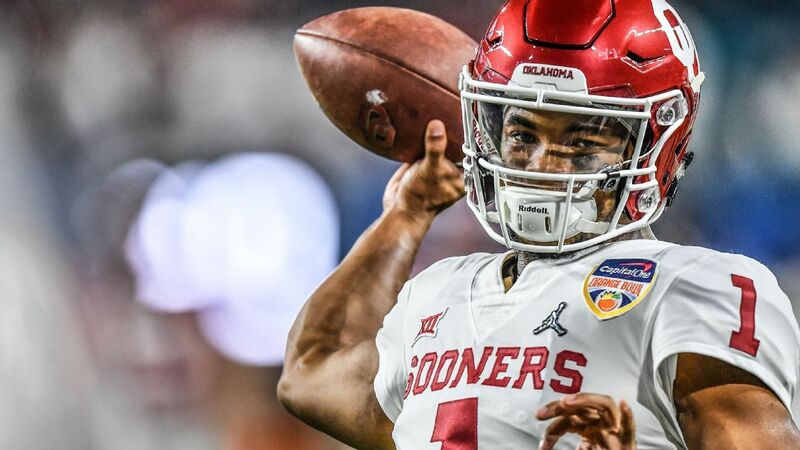 If Gruden makes a cryptic comment or two about Dwayne Haskins and Kyler Murray — or his own quarterback, Derek Carr — it’ll create a perception that the Raiders are in the market. In turn, that could motivate a quarterback-desperate team to leapfrog Gruden. Hello, Mike, this is Tom Coughlin in Jacksonville. We’re looking to move up. How much would it take to swap picks? Murray’s football-over-baseball decision has sparked a groundswell of quarterback speculation that can only benefit the Jets. ESPN draft analyst Mel Kiper Jr. said Murray, despite his listed height of 5-foot-10, could crack the top four. ESPN analyst Dan Orlovsky, speaking Tuesday on “Get Up,” called Murray a “guaranteed top-10 talent.” Tony Pauline, of DraftAnalyst.com, was less enthusiastic than the others, saying he doesn’t see Murray getting picked before the Washington Redskins (No. 15). He said the current fascination with Murray will wear off by draft time. The Raiders (maybe), Giants, Jaguars, Denver Broncos (No. 10) and Miami Dolphins (No. 13) could be in the quarterback market, so we’re talking about five or six teams and two top prospects: Murray and Haskins. They’re Alydar and Affirmed, Kiper said Tuesday on ESPN’s Michael Kay radio show in New York. You don’t have to be an economics professor to know the law of supply-and-demand could create a quarterback frenzy, which will increase the value of the premium picks. When quarterbacks are available, teams will do just about anything to get them. In the past three drafts, 10 of the 11 quarterbacks picked in the first round were selected by a team that traded up. The Jets were so desperate last year they moved up even though they didn’t know which one they’d get. Hope Murray and Haskins blow up the scouting combine in a couple of weeks. The quarterbacks will perform for scouts on March 1 in Indianapolis. Hope Murray measures at least 5-foot-10. That would allay some concern among talent evaluators because they could find comfort in the Russell Wilson comparison. Wilson, who has done pretty well for himself, was 5-10 7/8 at the 2012 combine. Besides, 5-10 sounds better than 5-9. Would Gruden really replace Carr? Well, we’re talking about someone who traded Khalil Mack, so anything is possible. The Jets consider themselves fortunate that Jamal Adams and Darnold fell to them in the past two drafts, but their bad luck far outweighs their good fortune. The fan base still is chafed that Peyton Manning blew them off in 1997. Maybe, just maybe, they can capitalize on the desperation of the teams mired in the same position they were a year ago.